Our monthly selection from the best bit of around the web. As John Lewis this week announces that their own brand Children’s cothing range will no longer be named Boys and Girls, and the movement towards more gender neutral clothing world wide we got thinking about our knits and how stitch patterns, shapes and colour could be interpreted and how men’s and women’s fashion were affected in the past. We found this article from Selvedge magazine very interesting, it highlights Shetland Fair Isle and how it used to be reserved for men, where as women would wear Shetland shawls and Haps to keep warm. Whilst we adore and love Haps (of course), we are now glad that we get to show all that complicated Fair Isle work off on ourselves. Androgynous clothing is becoming more popular, ‘Boyfriend Jeans’ have just become ‘Jeans’ and we can happily knit our jumpers for men and women! You can read the full article here. Chiara Vigo of Sardina is rumoured to be the last surviving processor of Sea Silk – and endangered Clams secreted saliva comes in contact with salt water and solidifies into keratin creating small amounts of fibre. The fibre is then harvested in tiny amounts at a time and carded, combed, spun and wovon into intricate pieces of art work. Vigo has an encyclopaedic knowledge of 124 natural dye variations made from fruits, flowers and seashells. Vigo’s work has been featured in the Vatican, British Museum and the Louvre. A really fascinating story from an amazing women who protects and cherishes her craft, you can read the full story from the man who went to visit Chiara and found out some of her secrets here. Textiles duo Harriet Wallace-Jones and Emma Sewell are celebrating their 25 year partnership this year. They have been creating Moquettes for Transport for London since 2010 and most recently have taken on the design of the fabric for the new Crossrail line (or the Elizabeth Line as it will be know when it opens). We love how they interpret colour and landscape into their patterns and fabrics. You can read all about their influences and partnership in this Guardian article. 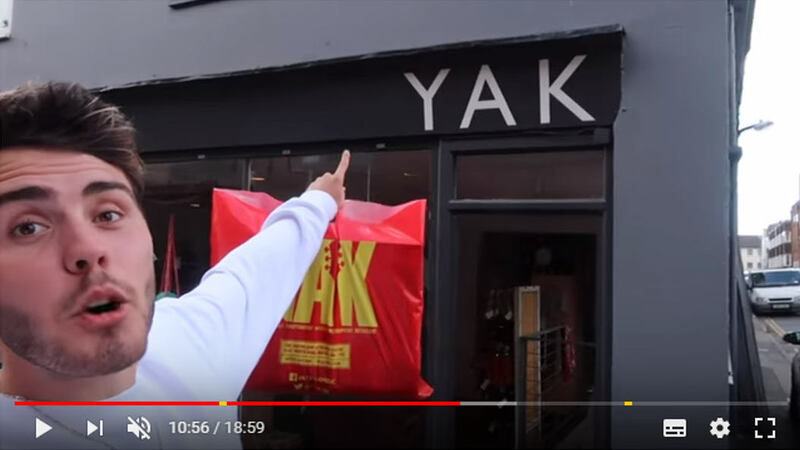 It was bought to attention by one of our Instagram followers that our Brighton Shop made it onto YouTube! Local YouTuber, Alfie Deyes (boyfriend of the famous Zoella) passed by the shop and gave a sweet rendition of his childhood knitting. You can watch the video here. We make an appearance at 10 mins 56 seconds.